This is a traditional Greek sweet, which I remember from childhood always being served with the coffee or juice whenever we went on family visits. It is more often than not baked in a square or rectangular dish, but can also be baked in a circular shape, as you can see from the photo. The fruit in the recipe here is quince - for the simple reason that it is my favourite! - but other fruit can also be used, most notably sweetened grapes in syrup. Beat the butter and the sugar well in the mixer and then add the salt, vanilla essence, orange rind and eggs one at a time and beat for another 5 minutes. Change the attachment on the mixer, and use the one for kneading. Add the flour to the mixture and knead until you have pliable dough. Take the dough and wrap it in cling film and place it in the fridge for 1 hour. When you remove the dough from the fridge, divide it into 2 parts. Butter a tart dish and evenly spread half the dough in it. Drain the syrup from the quince fruit and then spread the fruit over the dough, just enough to cover it. Take the remaining dough and, with the help of flour, knead it into long strings roughly the thickness of your little finger. Use these to make a criss-cross pattern on top of the fruit. Bake it in a moderate pre-heated oven for approx. 30-40 minutes, until the tart turns a slightly golden colour. Any ideas on food that can be prepared easily and quickly? What part of Greece is this recipe from? 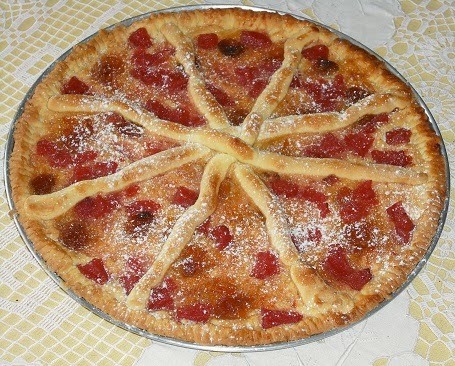 My Grandmother once told me how her Mother used to make this pastry that sounds very much like this one. she said that it looked like a pie but they used apples for the filling instead of quince. That's all she told me. I hope to surprise her one day with it.